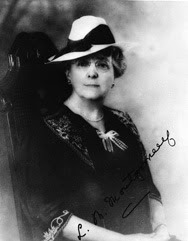 Did Lucy Maud Montgomery Commit Suicide? Well, here is an unfortunate situation. I have to say that I'm a bit floored and shocked by this new revelation that Montgomery didn't die of heart failure but of (an intentional) drug overdose. I learned this past fall that a new biography on Lucy Maud Montgomery was going to be released this past October entitled Lucy Maud Montgomery: The Gift of Wings . (If it's possible to commit the sin of lusting over a book then I've committed it with this release. I confess it to you now.) What I did not realize was what would be contained within these pages. Did Lucy Maud Montgomery commit suicide? Here is a supposed suicide note that was written by Montgomery that was found by her bed. It's hard to say whether or not that was a suicide note says biographer Mary Henley Rubio but it is easy to speculate that Montgomery wished her life over. I discovered these online news sources while I was researching information on The Story Girl which I just finished reading (review forthcoming!) and was floored! I simply can't seem to wrap my mind around it. I know it sounds a bit obsessive but I feel like I know Montgomery through her writings. I'm currently reading the first of theSelected Journals of L.M. Montgomery (1889-1910) and am loving getting to personally know the woman who penned all of these lovely stories. It almost feels like a crushing blow to hear of this type of end to such a life. Yet still is it unbelievable? It certainly is unpleasant. Death is hard to understand, period, and suicide is harder still. The question that forever hangs over the life is "why?" A never ending chorus with a simple question: Why? I have been thinking and dwelling on Montgomery's death ever since coming across this piece of news and fresh information about the life of a woman whose writing I have enjoyed and respected for so long. (BTW, I still do enjoy and LOVE her writing!) Out of all of the things that I expected to get out of this month's L.M. Montgomery Challenge, I did not expect this. Not at all. I am saddened because it is always sad to hear of utter hopelessness. It is horrific to think that Montgomery herself truly did succomb to the 'depths of despair' that she wrote about in Anne. In The Story Girl there is a part where the King cousins are talking about various sins that could be committed and there is a mention of suicide. The children affirm that you can't come back and repent from a suicide so best not do it. I read this particular book before I heard about the suicide suspicion and I thought it odd that she talked of suicide in a book for children. I don't know what she was trying to say on the topic, if anything. It just struck me as an odd passage in one of her books. I'm not drawing connnections or making any sort of statement - I'm just mentioning what she wrote about the topic of suicide. It is an ugly topic no matter how you look at it. Because He lives - I live. Oh, Carrie, I'm sorry. I know when you are completely enraptured by someone (whether you know her or not), you're shocked when you learn something unexpected about her. Lucy Maud Montgomery has been a personal hero to me ever since I was little. I spent countless hours with Anne, and even more hours with Emily. As I got older, I moved onto her published journals. In many ways, Montgomery shaped my childhood, my perspective on life, and who I am today. She was an astounding woman, a woman who was well ahead of her time. Sometimes I think about the things she would have done if she had been born in our time, and how much she would have enjoyed living in these times. Despite her successes, she lived a difficult and challenging life: losing the rights to Anne, marrying someone who wasn't really a good match, never really finding friends with whom she could bare her soul. I always got the sense from her journals that she was very lonely, even when she was younger. It was a time when both science and society didn't know how to deal with depression. It's sad to think of her filled with such despair and loss of hope - I cried, too, when I read about her suicide. She wrote "My position is too awful to endure and nobody realizes it" and I find hope in the knowledge that we do understand the ravages of depression, that we do realize how dark things must have felt to her. I was equally devestated when I found out. No one knows the personal hells that someone else is going through, this is one of the reason that Christians are encouraged to fellowship with one another, so that we can care for each other. I cannot imagine how alone someone must feel to take their own life but my heart goes out to them. If anything we can show our love by continuing to hold them and the work they gave us in life as a precious treasure. And as we walk on in our lives let us be aware of those who are lonely around us, perhaps a smile and kind word is all it takes to keep them going. Nooooooo. That makes me so sad. :( It's so heartbreaking to find out that childhood hero had such a tragic end, no matter how long ago it was. Oh Carrie I'm so sorry for you have to discovered this. I AM glad that you are shining light on this author's delightful work, because I am SO enjoying my read-through of Anne. I reviewed a book from a woman who wrote about her father's totally unexpected suicide, and it was so eye-opening. The review is here: The Suicide Index. Oh, this is so sad. But you drew the right conclusion. Our hope is truly found in Christ alone. How sad. I can't imagine that level of hopelessness. Very sad. And even sadder to think that she might not have found peace at the end. I remember a line from one of the Cadfael books: "Despair is a deadly sin." How true this is and how tragic it can be when we take our eyes off Christ. This was headline news in our papers this summer. I was upset when I read it, but not shocked as I had read her journals many years ago and knew that she had had a very unhappy life. Her husband suffered from bouts of severe religious melancholy (probably manic depressive) and she was continually covering for him in the congregation. She would have been very isolated in her role as a minister's wife. She never let down in front of others. She was very concerned about appearances and didn't "air her dirty laundry" - a common saying on the Island. There wasn't the support or information about depression in those days. It was considered shameful - especially for someone in ministry. I think her fiction revealed her inner self - her best self - what she hoped and wished for, but never had. I have felt very sorry for her. I think she had quite a tragic life. But she was one wonderful writer - and has left a rich legacy. Carrie,To answer your question, I am Islander born and bred. and actually related to LMM. A distant cousin. I was also sad when I heard this. It's always hard to hear and think about this happening to anyone. And I love "In Christ Alone"! I am His and He is mine...here in the power of Christ I'll stand! Amen! I was shocked to learn that she committed suicide, too! I have that new biography, but I haven't read it yet. One of these days I will get the chance! I thought you knew! I came across the info on line right after I asked for your recommendation for the challenge. Thank you for the song. I heard it for the first time in Aug. 07 at a Beth Moore Conference (you can read ALL about my weekend in my archives). :) Little did I know just 2 months later I'd have a miscarriage. For me that song is forever tied to a really awesome time and a really terrible time. It is very special. I needed to hear it today. Oh my. You just informed me. Just to let you know...I reread this today, but the link to the suicide note is not found. Thankyou for having this blog its soo nice to hear from others who enjoy all the LM montgomery books. I have read and re-read them. I recently finished reading her journals. I personally think that she had alot of opportunities more so than other women of her era. She went to college, qualified as a teacher, worked as a journalist and was a world famous author. Her tragic life was all in her mind- because she had depression. If she had ever looked at her life from someone elses perspective than maybe she would have realised how lucky she was. She complains in one part of her journal about not being educated because she never gained a BA degree. My question here is how many women in the 1890s went to University and gained a BA degree. BA degrees for women only became commonplace in the later part of the twentieth century. She was extremely privileged to have gone to Dalhouise College and studied English literature. Which is where I suspect she really learnt the craft of writing. Moreover she nearly ends up as an old maid. But out of nowhere Ewan turns up literally on her door step and marries her. He even waited many years to do this. I am also an LMM fan- have read all her books, own each journal and even, so many have told me, look physically much like Maud in the picture of her in 1898- also an aspiring writer. I gathered before the story came out that Maud committed suicide- reading the journals I even saw it coming. As a fellow Christian, I wish Maud would have come to know the Lord as her friend. Really, she had no belief in Jesus as divine or God on a personal level despite being a minister's wife. I do hope she found peace in the end. Without God in my own life, as my own friend, I might have taken Maud's sad path. I always felt, in reading her story, that if she would have trusted in God she would have been far more contented. My brother took his own life and it was shortly after he had accepted Jesus as his savior. He was in a deep depression bordering on psychosis and the drugs he was prescribed by his doctors were, we strongly believe, a contributing factor. He had just met the Lord and didn't know how to draw enough strength from him to keep going. But I know he's with the Lord and I don't despair about Lucy Maude either. She wrote a lot about faith in her books and perhaps, like my brother, just didn't have, or couldn't access, the strength to carry on. I, too, have always loved the Anne books and also Emily and Pat. On a recent trip to PEI (my first ever) I found several new (to me) books to delight in. I now have almost a whole shelf in my bookcase filled with my beloved L. M. Montgomery books that I will reread, cry and laugh with and thrill to over and over for the rest of my life. What wonderful gifts she gave to all of us!